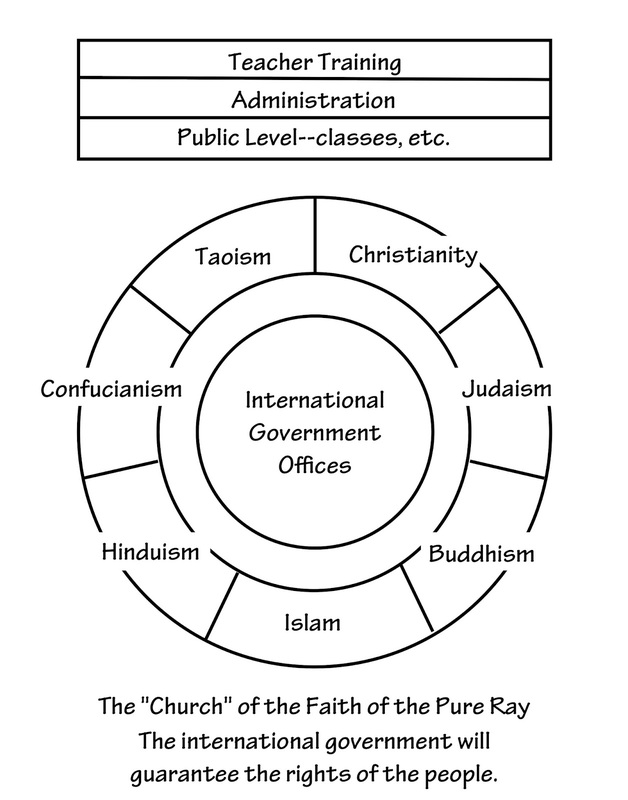 Around the circle, in the upper right of the circle is Christianity, , then Judaism, Buddhism, Islam, Hinduism, Confucianism and Taoism. In the center of the circle will be offices of the international government. The lower floor will be classrooms, the second floor will be administrative offices, and the third floor will be training for people who wish to become clerics of their religions. Clerics from each of the seven major religions will work together in the same building, each teaching the principles of their religion to the masses as they go through the classes on how to create the life they want. On the top floor there will be classes for training new clerics, and on the middle floor, administration offices. In the same building will be offices of the proposed international government that will guarantee the rights of the individual to leave if the person believes he or she is being oppressed. It may be possible for those who seek refugee status to go to the churches to request permission to leave, and while requests are processed, and referred through Faith of the Pure Ray churches in their destination nation, to attend the classes at both ends of their journey. This would enable refugees to be settled into other locations where their skills are needed, rather than masses of refugees running from conflicts to descend on nations that are not prepared to assimilate them into the culture or economy. Our churches are still in the planning stages.